"One summer I decided to paint a red Rose and bud. Instead of a multi-colored arrangement of a variety of flowers, I wanted to concentrate on one unfurled blossom and a tight bud and I wanted them to be red. The Rose is the most challenging flower to paint when fully open because of the complexity of the unfurling shapes. 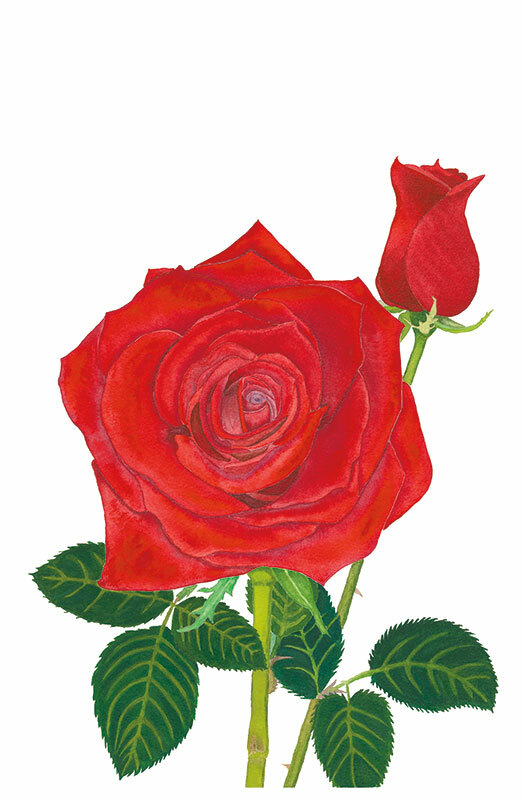 The red Rose has historically been the symbol of the intensity of romantic love since ancient times. The historical meaning of flowers relates that Roses are symbolic of deep love, concentration, intelligence, balance and passion. Besides having complex meanings according to their colors, Roses can generally mean devotion, honor & intense commitment on many levels. The red Rose can also represent courage and beauty."